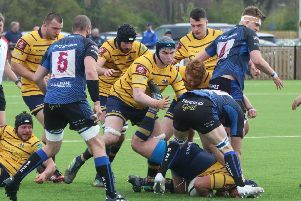 WORTHING Raiders Rugby Club skipper Scott Barlow admitted he was not expecting his side to get off to such a sloppy start in National 2 South this seaason. Raiders have found things tough going so far and sit fourth from bottom. Kieron Dawson’s side picked up three victories from their opening four league matches and looked to be going well. However, poor form in recent weeks has seen them lose their last four matches without picking up a point. Raiders have suffered defeats to second-from-bottom Redingensians, Southend Saxons, Clifton, Bury St Edmunds and Cambridge and Barlow was not expecting his side to start so badly. He said: “To be honest, I was not expecting us to lose some of the games we have this season. “We lost some really experienced players over the summer and that has not helped. “But, if I’m honest, I think we should have made a better start than we have. “We started playing a new system this year, so it’s taking time to adapt to that. Worthing’s latest defeat came at the hands of high-flying Cambridge at the end of last month. The table-toppers, who have won seven of their eight matches, ran out 29-17 winners on the day. A fine first half display saw them race into a 24-0 half-time lead, which became 29-0 soon after the interval. Raiders fought back in the final 20 minutes and picked up 17 points and Barlow was pleased with what he saw in those final few minutes. He said: “I think the way we came back in that one was good. “We showed real spirit and were unlucky not to take a losing bonus point in the end. Raiders travel to fifth-placed Bishop’s Stortford on Saturday, looking to halt a four-game losing streak. Barlow said: “We want to stop the run we are on. “It is never an easy place to go but, hopefully, we can get the victory. “We want to push up the table and a win on Saturday will help us kick-start that.